E-stamping (SHCIL) is easy and a convenient way of paying stamp duty to the government through the computer based application and secured transaction method. the government of India comes with a new method of stamping called e-stamp paper to fight against fake stamp paper. 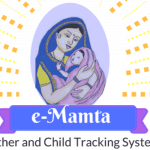 initially Started with paper a major city Ahmedabad, Baroda, and Rajkot of Gujarat state and Bangalore City of Karnataka and Delhi to provide providing e-stamp paper. Earlier you have to buy stamp paper before 2-4 days before you want to use from local stamp vendor. Now as per new method, you can purchase e-Stamp paper on the spot from registrar office whenever required. 1.3 What Details available to Verify? 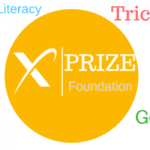 2 How SHCIL e-Stamping Verification work? 3.1 SHCIL – Stock Holding Corporation of India Ltd.
4.1 How to obtain e-Stamp Certificate? if you have e-stamp paper and want to check the authenticity of e-stamp certificate online then follows this steps. 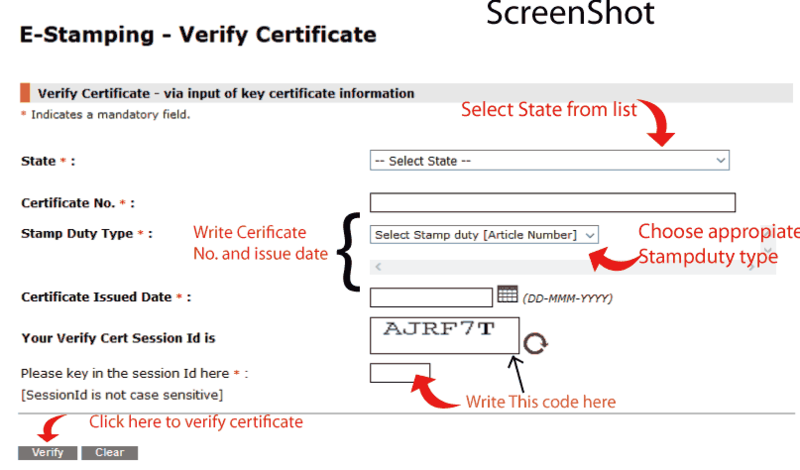 Steps to verify e-stamp certificate details online through Shcilestamp.Com portal by providing details of e-stamp certificate. What Details available to Verify? 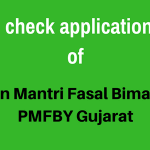 Following Details can be available on shcilestamp.com portal for verification of e-stamp. How SHCIL e-Stamping Verification work? Now, you have to pay e-stamp fees to a representative of stock holding, who give you Unique system generated a number called as UIN (Unique Identification Number) which mentioned on the e-Stamp Certificate by using SHCIL E-stamping system. also, one can register their documents by using this e-Stamp certificates and UIN (Unique Identification Number). you can check the authenticity of the Certificate through www.shcilestamp.com using this Unique Identification Number or E-stamp Certificate. using this Certificate number and unique stamp code (UIN) you can also verify Status and details, the price of stamp paper and Details of Contracting Parties. 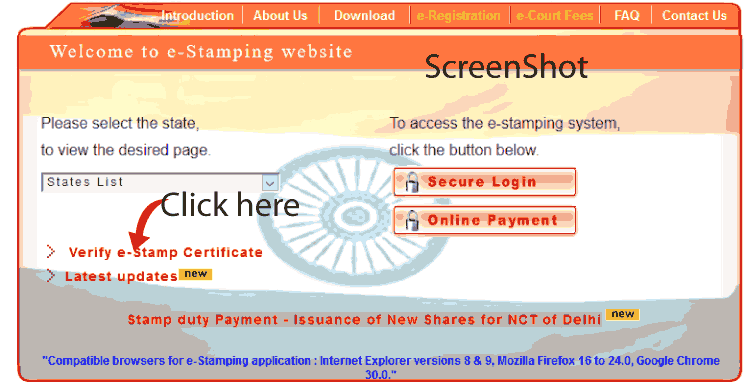 Shcilestamp.Com Portal is maintained by SHCIL (Stock Holding Corporation of India) to provide various e-stamp related service online to its clients. following service are available st shcilestamp.com portal. SHCIL – Stock Holding Corporation of India Ltd.
SHCIL (Stock Holding Corporation of India) is Central Record Keeping Agency -CRA Appointed by Central Government under Ministry of Finance, Department of Economic Affairs. SHICL is Responsible for User Registration, Imprest Balance Administration & Operations and maintenance of overall E-stamping Application. SHCIL Will appoint Authorised Collection Centers (ACC) to issue E-stamp Certificates to clients from their counters. E-stamping is the new method of stamping, which prevailing system of physical stamp paper/ franking is being replaced by computer base application in the secured electronic way of stamping documents. earlier government come with franking to fight against fraud stamp, but due to the limitation of banking government come with the e-stamping system to remove this limitation of franking and physical stamping system. the great advantage of e-stamp paper is that cost of printing and selling can be reduced from 6%-15% to 0.6%-0.15%. 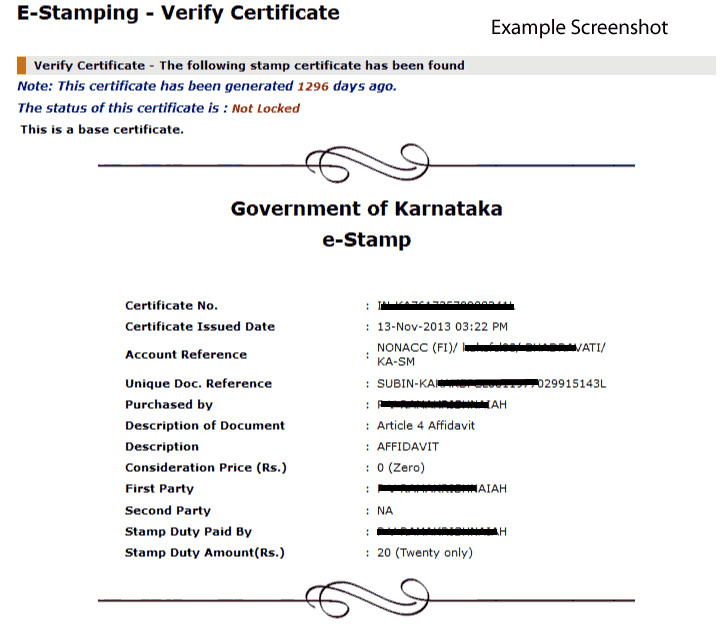 verification of e-stamp paper is possible, now it possible to check e-stamp paper is genuine or fake through SHCIL portal www.Shcilestamp.Com online. 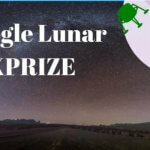 How to obtain e-Stamp Certificate? to get e-stamp certificate one has to visit nearest Authorised Collection Centers (ACC) appointed by SHCIL and fill the application form. such E-stamp certificate generated immediately after the realization of funds.